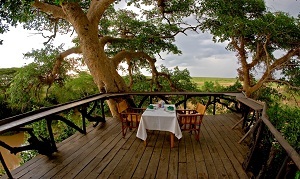 Basecamp Masai Mara – fittingly referred to as the ‘mother of all camps’ by our staff - is where our story started. Lovingly run by our Maasai staff – Basecamp Masai Mara is as much a home as it is a tourism destination. Here guests become more than visitors - they become part of the Maasai community. As you disembark your plane at Olkiombo Airstrip one of our friendly and knowledgeable Maasai Guides – the true experts – is standing ready to take you on your very first Game Drive in one of our tailor-made 4x4 Safari Land Cruisers. During your drive you will be introduced to the exceptional wildlife of the Maasai Mara‚ including thriving populations of lions‚ elephants‚ cheetah and leopards. You will arrive at Basecamp Maasai Mara - our very own cradle of mankind - for lunch‚ freshly prepared by our trained team of Maasai chefs. After lunch wander around the camp compound and reconnect with your well travelled self‚ while you take in the tranquility of Basecamp Masai Mara. At 4pm meet your Maasai Guide to explore new dimensions of the Savannah during your Afternoon Game Drive. Return to Basecamp Masai Mara in time for a mouth-watering three-course dinner‚ followed by story sharing and stargazing around the fireplace. 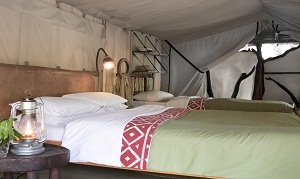 When you are ready‚ retire to your tent and be lulled to sleep by the sounds of the savannah. Awake to the magnificent ‘wake up call’ of Basecamp Masai Mara’s astonishing birdlife. After breakfast meet your Naturalist Maasai Guide for a Camp Walk around the camp compound. During your walk you will be introduced to some of the operational elements that have made Basecamp a leading pioneer in responsible tourism. Your Camp Walk includes a visit to the Basecamp Maasai Brand (BMB) workshop‚ one of our capacity-building projects that employ 118 women. Complete your Camp Walk by planting a tree in our Tree Plantation‚ just like the Obama family. After a freshly prepared lunch‚ served underneath the trees overlooking the Maasai Mara National Reserve‚ stroll across our private suspension bridge to join your Maasai Guide for an Afternoon Game Drive. Finish your Game Drive with a traditional Basecamp Sundowner under an Acacia Tree. 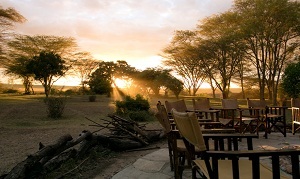 Return to Basecamp Masai Mara for dinner‚ followed by story sharing and stargazing around the fireplace. Wake up at dawn in time for a final Morning Game Drive. Witness how the savannah comes alive as the sun rises. Return for breakfast. After breakfast collect your things and say your goodbyes. Reach the Ol Kiombo Air Strip in time for your scheduled 11:00hrs flight‚ the perfect departure time for continuing your African adventure by the coast or in good time for your international connections. As you leave‚ treasure the feeling of coming as a guest‚ staying as a friend and leaving as a partner. As one of our guests said at departure: “words fail me”.